A symbol of magnificent architectural work and impeccable service, the Patnitop Heights is a renowned property that offers a comfortable stay to the visitors. It is a perfect combination of world class facilities and utmost relaxation. Nestled amidst lush greenery, the hotel offers a secluded walk and enchanting views of the Chenab basin. 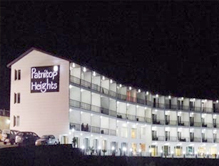 A wonderful setting for spending the holidays with the family members, Hotel Patnitop Heights provides a memorable experience to the guests. Accommodation With the 55 rooms, classified into economy and executive suites, come top-notch facilities beyond the expectations of the visitors. Some of the in-room facilities offered by the resort are LCD television, intercom, running hot and cold water and air-conditioner. 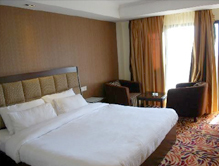 The visitors can stay updated through the Wi-Fi internet access rendered in each room. Dining and Bar: A wonderful amalgamation of great ambience and excellent service, the multi-cuisine restaurant of the Patnitop Heights Hotel in Patnitop offers the finest dining experience. Be it Indian, Chinese or Continental, the individuals can relish the exotic food prepared by the expert chefs. Make your holidays fun-filled and memorable by booking exciting travel deals at Tourmyindia.com and cherish the long-lasting memories.